I know my life is not worth much but if they do can't even apologize to my family for being irresponsible and letting their kids play on an ice-covered lake, I'm gonna bet theirs isn't worth much either. So, hell to the no. Apparently, a Filipino isn't an effin' piece of sh!t like me because he actually saved two kids who were drowning in lake back in 12 December 2007. 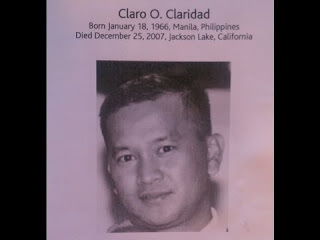 His name is was Claro Claridad. He was 41 then and was vacationing in Jackson Lake near Wrightwood with his family on Christmas days. His boy and four girls were, you know, chillin' with him. Claridad realized that there's a group of people panicking not far from where they were. The problem is that they were all on an ice-covered lake. Take note that the whole lake is not frozen, it's just the top. He knows, because he has been in the US for a while, that if they fall to that water, there is really very slim chance you'd survive. The water is so cold it could literally freeze the last moving cell of your brain in less than a second if you go in. However, he realized that the people panicking were panicking because several kids were in the water. He was like... well... if those were my kids... so, he rushed to help. He jumped into the water and saved both kids from drowning and dying of Hypothermia. The problem is that he was under too long and by the time they got to the hospital, he was pronounced dead. I know that some of you would think that as much as it was an admirable thing to do, he could have just called 911. He had children of his own anyway. Besides, a single event doesn't define your entire life. True, he could have called 911 but it doesn't make what he did any less noble. True, that a single event in your life doesn't define your entire life but Claridad was one hell of a father and that is precisely the reason he jumped in the water. He knows that had it been his children in that situation, he would hope that someone, a parent like him would be near the kids and know that his kids were worth saving. Rest in peace my chilhood friend and my nieghbour in Manila, Philippines, i salute you for being a brave man.